Tournament mode + extra arenas are now available! Play as David or Monty in the tournament mode. Defeat all opponents and become the champion of R2F! Compete as David or Monty in arcade mode and fight the greats of wrestling over 3 rounds in one killer battle for supremacy. If you’re in it for the long run, then compete in the tournament mode where each fight is more difficult than the next and the stakes are higher than ever. Win every match or face a disgraceful knockout in this war of the legends. Meet Monty, an ex- criminal who is finally out of the hell hole of prison and is back on the streets fighting in the underground scene. His call of duty is with wrestling and this time his fight is till the end for the ultimate goal: The Championship. David is Monty’s brother and also his nemesis competing for the Right to Fight title and he will spare no expense in competing against his own blood in order to win. 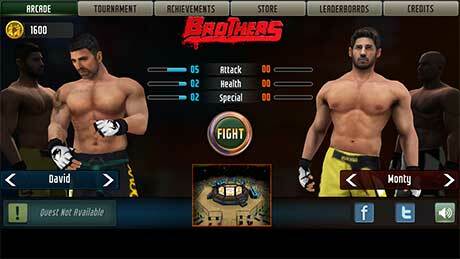 Brothers: Clash of Fighters features all your favourite real life fight moves as well as combos and finisher moves. Hit the taps and swipes at the right time to execute these special moves and inflict maximum damage on the opponents. Choose between the different arenas such as: The Boxing Ring, Underground, The Gym and The R2F Arena. Rack up your wins, climb up the leaderboard and finish all achievements to become an immortal name in the world of fighting. Complete the daily missions and participate in quests to win exciting movie merchandize and the grand prize: A chance to meet the cast of Brothers! Follow @vroovygames for more information on contests.